Rome is chaos at its best. Crowded, busy with so much to see it is easy to feel overwhelmed. With our crew we broke it down into a two day visit, and one sweet guide to help us see as much as we could, or at least as much as the kids could withstand. Our first stop was checking into our hotel, The Westin Excelsior www.starwoodhotels.com. Yes after my NYC post I promised never to stay in a Westin again but this one was A-MAZ-ING! My husband booked it so I was just along for the ride, and I was pleasantly surprised. I would mark this as the third best hotel in the world that I’ve stayed at! The kids loved having their own beds for once during our two week trip! The staff was so accommodating and gave us a suite that fit all eight of us in the lap of luxury. We loved it. Three kids to a room, a living room, and one more room for Trent and I. We couldn’t have been happier. From here our guide met us, we grabbed taxis and were off to Vatican City. Though it is called a city the Vatican is actually the smallest country in the world. My kids were sorely disappointed that getting another stamp on their passports was not necessary in Vatican City, so though its a country leave your passports in a safe at the hotel. In Vatican City ready for an informational tour & maybe a chance to see the Pope? Our guide, Fabio with Imago Artis Tours www.imagoartistour.com, was excellent and gave us just enough information to let us know what we were looking at but not too much to leave the kids bored out of their minds. Children under 8-years-old are free to enter the Museum of the Vatican but everyone else must pay 15E to enter, www.rome-museum.com. Of course to the kids this was just another museum with a lot of statues. Most of these have been broken and put back together as well as could be expected. Of course we were excited to get into the Raphael rooms and Michelangelo’s Sistine chapel, where we learned was the actual spot where the smoke is released declaring to the world when a new Pope has been determined. Of course the Sistine Chapel is something I had to see to believe, and it is quite a work of art! Our guide was excellent in describing the detail and purpose of many of the paintings and the kids were intrigued by his knowledge. 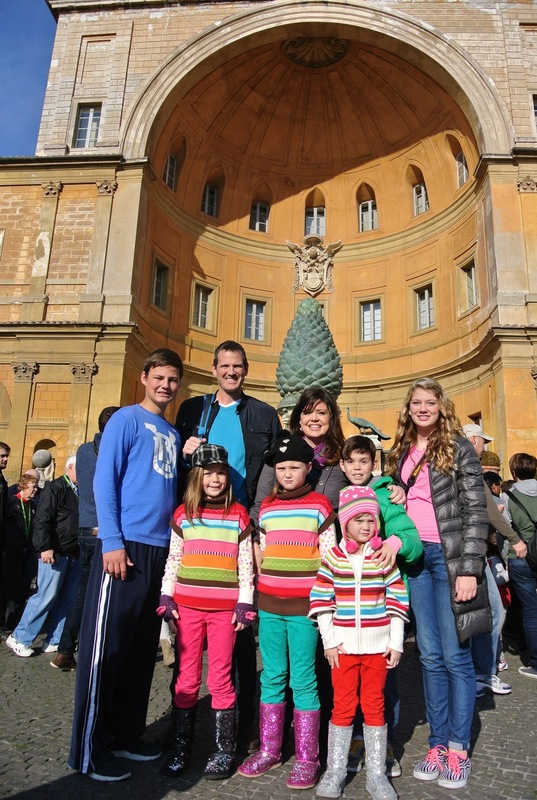 At the end of the Sistine Chapel tour we made our way over to Peter’s Basilica, saintpetersbasilica.org. It is the grandest scale cathedral I have ever been in. It made me wish that the Church of the Nativity in Bethlehem was as magnificent as St Peters. Of course this is the site where Peter was crucified upside down when it was only Vatican Hill. There are many beautiful mosaics to see on the walls and floors, pope crypts, and huge statues, most notably Michelangelo’s Pieta. This statue is protected by bullet-proof glass after an Australian tourist ran at it with a hammer back in the 70’s and damaged the hand and nose of Mary. Just a little interesting fact. Leah is a little horrified by the preserved body of Pope John XXIII. The kids were a little freaked out by the Pope that has been preserved and dipped in a wax laying in a glass coffin. I know that much of this went over the kids heads but I’m sure this image will stay with them for a lifetime. After leaving St. Peter’s Basilica we said goodbye to our tour guide and took taxis over to a nearby restaurant called Gusto’s http://www.gusto.it. We barely made it in by 3:30pm before it closed for the afternoon at 4:00pm. Of course we filled our tummies, rested, used some much needed bathrooms and took off again for our Heart of Rome Walk that is recommended in Rick Steve’s book “Italy” 2012. If you haven’t purchased a Rick Steve’s book for your European travel I highly recommend it, www.ricksteves.com. I love his detail and honesty in describing so many sights around Europe. We used this book to start our walk straight from our restaurant and over to the Spanish Steps www.rome-tour.co.uk/spanish_steps.htm, named for the Spanish embassy to the Vatican for over three hundred years. 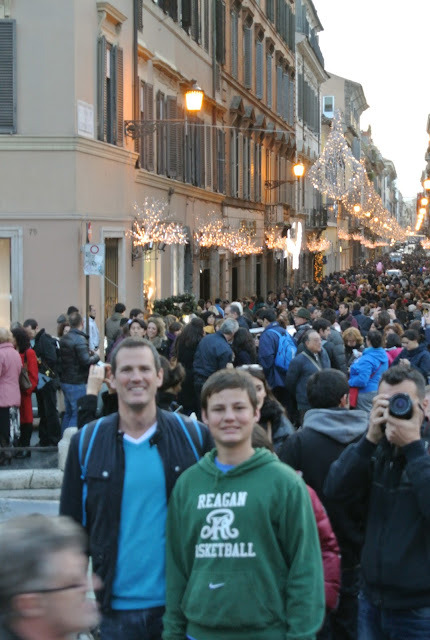 We were amazed at how many Italians come to just hang out at these sights. The streets were packed and we were a little overwhelmed keeping our kids at our sides. 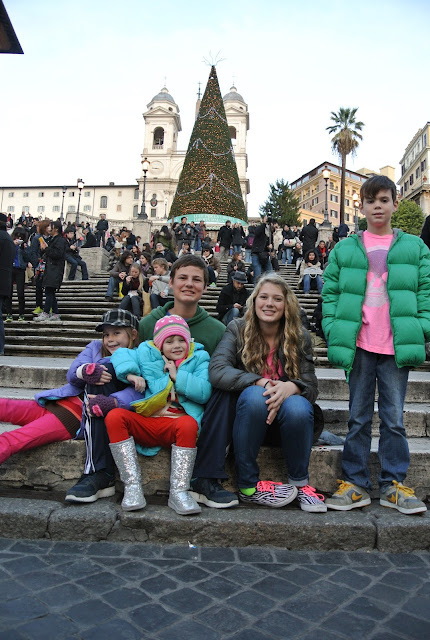 From there we walked over to the Trevi Fountain and made our wish! We hope that it also brings us all back to Rome someday though Lexi may not be invited after pretending to fall into the water. 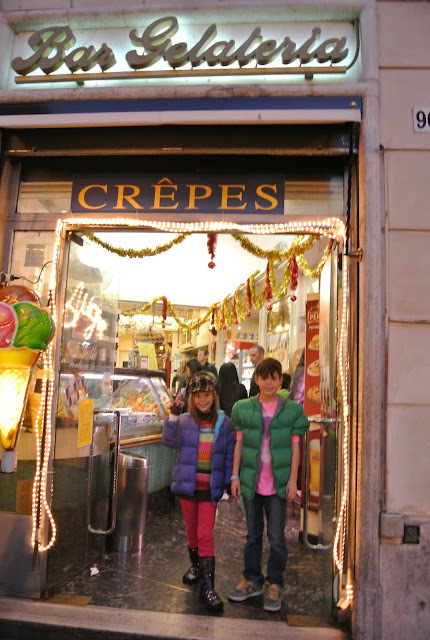 Of course we also had to stop again for crepes and gelato to refuel our engines and continue the walk. It actually is a very simple walk and enjoyable too since so many people are out enjoying the good weather during December. Onward our “Heart of Rome” walking tour recommended by Rick Steve’s took us over to Piazza Colonna, onto Piazza Capranica right into the heart of the Pantheon. The Pantheon, www.rome.info/pantheon/, is the home of the domed ceiling created by the Romans and an inspiration to so many architects. It is a huge building and free to the public which also entombs two Roman Kings and that of the artist Raphael. When I told my kids that this was where Raphael was buried, Colton replied, “You mean the teenage mutant ninja turtle?”. I could tell by this comment he had seen enough Rome for one day. We still had one more stop on our walking tour so we ventured on and came across The Four Rivers Fountain and Piazza Navona. Our tour guide Fabio had highly recommended taking the kids to Piazza Navona so we knew we had to make it our last stop of the day. 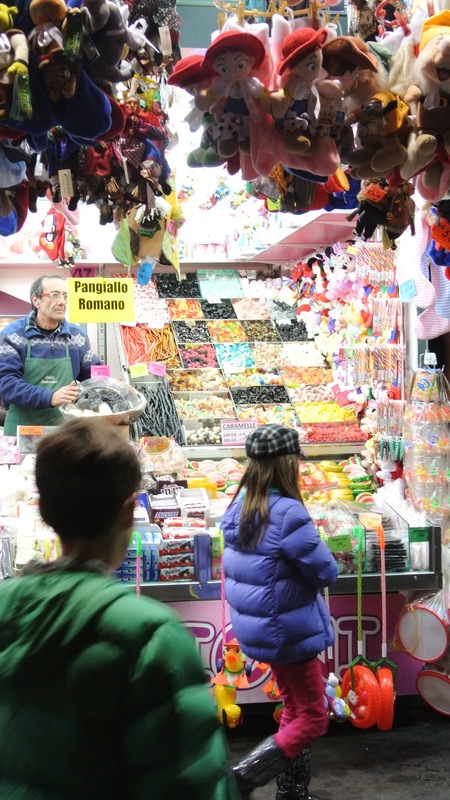 The Piazza does have a carousel, some street performers, and lots and lots of shopping. Imagine Chinatown exploding but at Italian pricing. Though the kids begged for many of the items we dangled the idea of going back to the hotel for a swim and that soon won them over. One quick taxi ride back to the Westin and we were safe from being loaded down with many toys and novelty items we did not want. Sorry but this shot is irresistible to me! 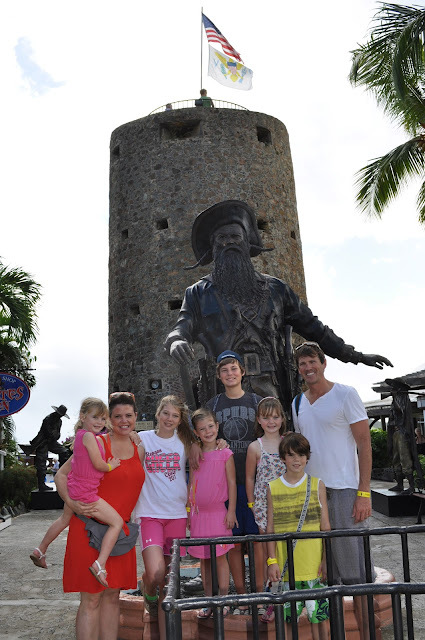 After a good nights sleep in our excellent accommodations we were ready for another fun filled day of sight-seeing. 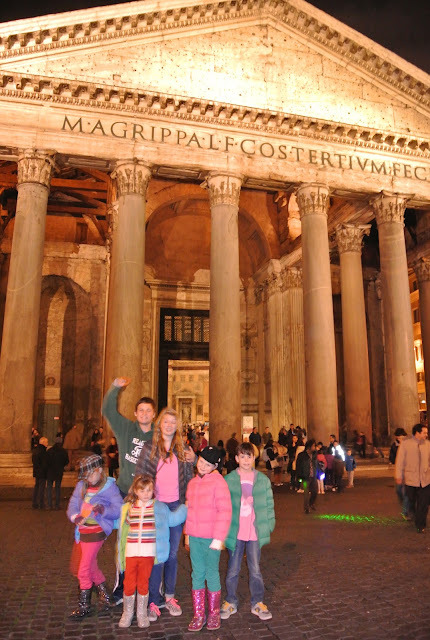 Check out next weeks post on Roaming in Rome Part Deux for more places to see with your kiddos abroad in Rome!